Land Shark!! 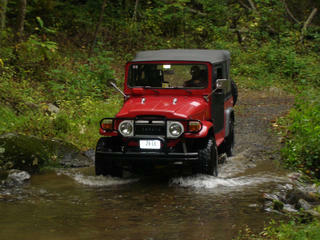 : Off-Roading in the FJ40!! Columbus Day weekend was supposed to be a weekend in Pittsburgh, celebrating the return of hockey at the Penguins home opener against the Bruins. However, thanks to a lot of people in the burgh excited about the new free agents and the number one pick Crosby, there were no tickets available for me. Instead, I decided I would spend the time in DC. On Saturday was the annual Shirlington Oktoberfest, which I missed last year. I decided that I would go to that this year, and we found a coupon that was a 2 for the price of one admission. Matt and I couldn't turn down all the good Oktoberfest beer that we could drink until 6 pm for the price of $10 could we? Well, by the end of the festival we were soaking wet from the big rainstorm that was here all day and we had more than enough beer. It was definitely a good time though, and then we went home to watch my free Direct TV NHL Package preview. Even though I couldn't be there, I could watch the Pens lose to the Bruins in OT. 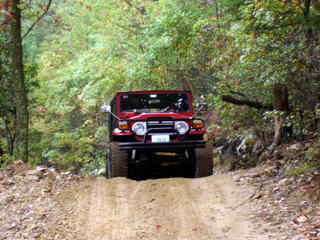 The next morning, provided that the rain had stopped, Matt and I decided to go camping and 4 wheeling out in VA. 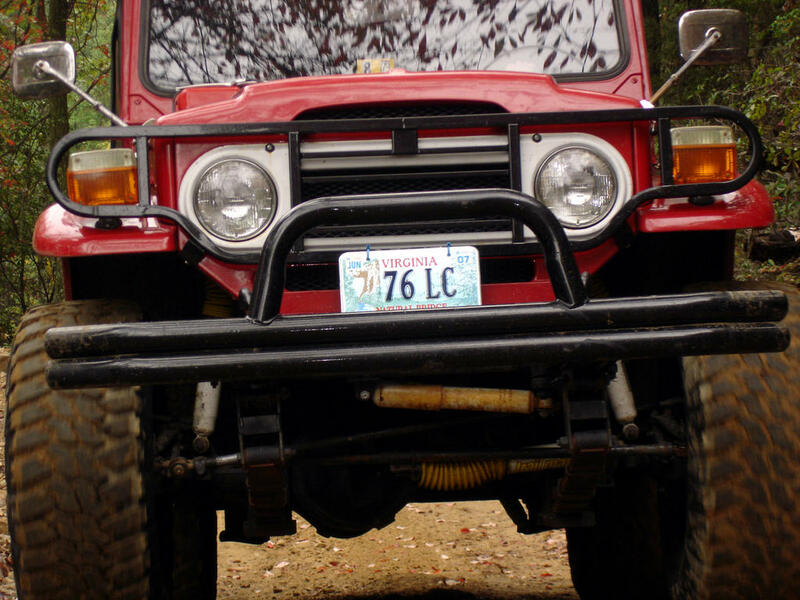 I have been dying to try out the Land Cruiser on some trails since I had gotten it, and this past weekend was a good chance. I found out where some good beginner trails were, we loaded up the dogs and gear into the LC, and we hit the road Sun. noontime. We were a little bit behind schedule, but we didn't really have a set plan. My goal was to get down towards Madison, VA where there is an area called the Rapidan Wildlife Area. However, on the way there, we passed the really good vineyard that AD and I went to near Culpeper. Matt and I stopped off to try a few of the wines, and he decided to pick up a few bottles. We finally made it to the trailhead at about 3:00. Without really knowing what to expect, off we went! It started out as a nice dirt road, and then gradually diminished as we went. There were a bunch of stream crossings and the trail was basically paralleling fast running river. We passed a bunch of campsites as we went and there looked to be plenty of off-shooting trails to explore at another time. There were a number of really rocky sections that really bounced us around. I know the dogs were not all that happy with us for taking them on this crazy ride, but we just felt it built character! At one point we found this cool side trail that had a really steep section that people had been trying to get up. I decided to give it a whirl, but with the wetness and a ditch in one side of it, I couldn't get completely up. It continued to get later and darker as we went, so I decided to stop at a turn-around point and we let the dogs out to run around a bit. We cruised back down the trail, bumping around like crazy, and then I stopped for gas and we tried to figure out how to get to the camp site. The one thing I forgot to mention was that I had left the directions at home, so we were just using a map and where I vaguely remembered things were! It was getting dark and we were really hungry as we were passing through Luray, so we decided to stop at a pizza place, where our eyes were definitely MUCH bigger than our stomachs. We attempted to get some directions from there to the campsite, which I didn't think was too far away, but we weren't very successful. Eventually we made it there and only 2 of the 10 tent spots were taken, so we were in luck. It's always a challenge to get things set up in the dark, but we didn't have too many problems. The problems we had were finding any good wood for a fire. We didn't have too much success there, but it was a good fight! The tent was a little crowded with 3 dogs and me and Matt, but we survived and I managed to get a pretty good rest. We were up early though with the sun and the dogs. They didn't want so stay in the tent and let us sleep in, so we were up and had camp broken down by about 9. 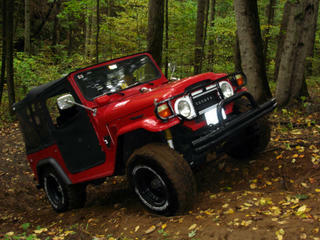 Some Columbus day off sleep-in... Oh well, we had more wheeling to do!! This time we headed to a spot pretty close to the campsite in the George Washington National Forest. It was a place called Tasker's Gap and the trail was Peter's Mill. 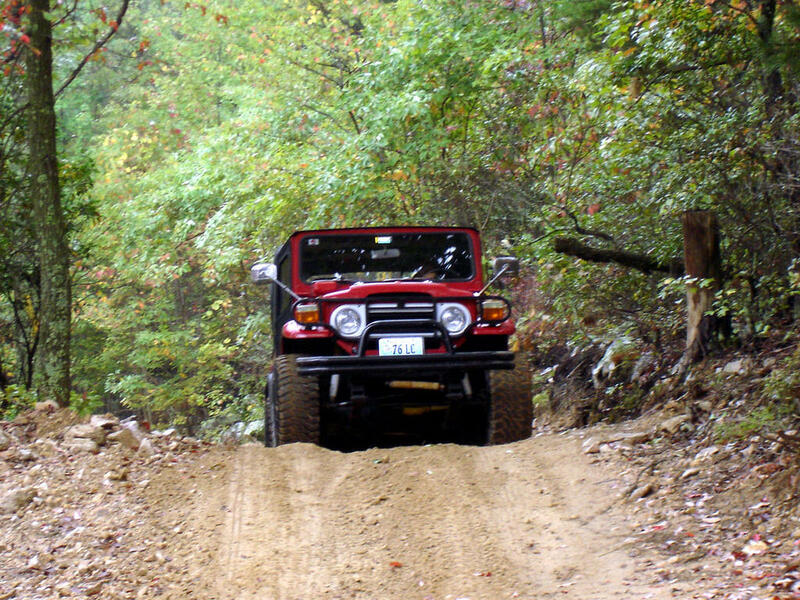 I had heard that it was like a highway going through the woods, but I didn't quite get that feeling as we were on it. It also looks really straight on the map, but is not even close on the trail! I feel like it was a good beginner trail for me! The trail was about 7 miles long and we saw only 2 ATV's the whole time. It was nice to have the trail all to ourselves. About halfway through, there was a big open area where we stopped to let the dogs run again. I don't think they were getting used to all the bumps, but they were definitely dealing with it better on this trail.